Creating a logo and all of the associated branding material just got easier. Creating a logo and all of the associated branding material requires a lot of experimenting. Experimenting requires repetition and repetition wastes time. As a brand designer myself, I wanted to quickly preview variations of a logo, typefaces, colors, and patterns all together on a variety of collateral items. I also wanted a way to then easily output these assets in ready-to-use formats that didn’t require hours of production work. These tasks are tedious and could very easily be driven by software…not endless clicks of my mouse. This is why we built Emblem. Emblem was created to not only help non-designer types get started on their branding project but also to help actual designers speed up their exploration process. Emblem helps bridge the gap between exploration and implementation during a branding project. The Emblem process begins by simply typing in a name. 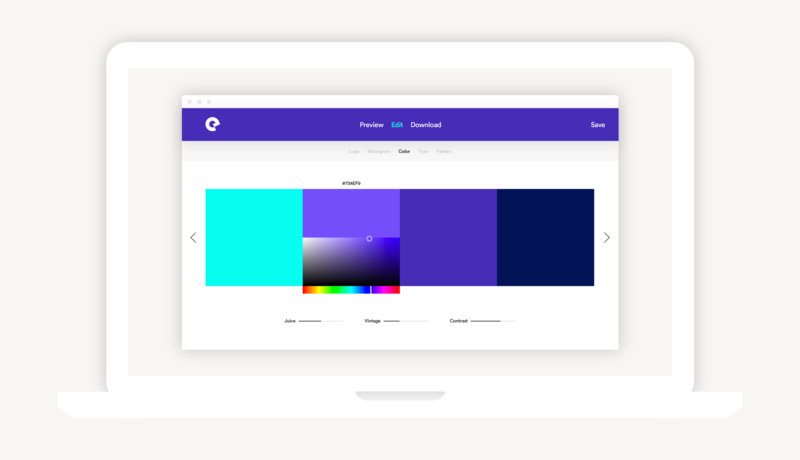 We then generate an infinite visual buffet of type and color variations. This is a great way to kick off the creative process by exposing yourself to options you may have never considered or to vet the direction you may already have in mind. These combinations are created by mixing a little machine learning, a little serendipity, and a whole lot of curation by our design team. 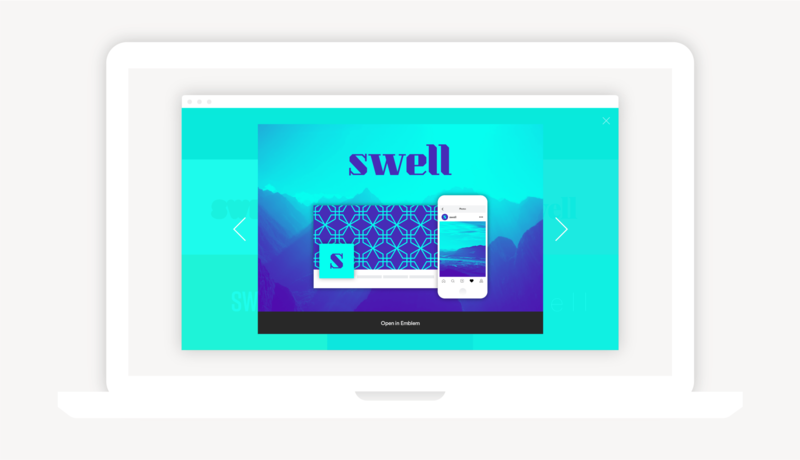 Tapping a style tile gives a quick peek into the full visual language behind a brand. We instantly get a feel for how this brand will scale across a variety of platforms, as well as some of the supporting brand elements, such as patterns and photos. This is insanely helpful for getting a quick gut check on the potential of any given direction. We’re able to then explore similar variations by tapping left and right. Being able to cast a wide net and then instantly explore a narrowed set of options and easily jump in-between, has changed the game for our workflow. No more starting with a blank canvas. Remember, the only thing we’ve had to do up until now was type a few letters and we’ve already covered an immense amount of visual ground. Now that we’ve found a direction that feels good we’re able to dive in and see the full brand in all of its glory. Having the opportunity right out of the gate to preview how a brand will play out on a variety of digital assets as well as printed goods is invaluable. The design time we’ve saved thanks to this one page alone still blows our minds! Early on in the development of Emblem we wrote in giant letters on our whiteboard, “lead with curation, but allow for customization”. This concept was instrumental in ensuring we created a platform that delivered high quality results on its own but also would account for fine tuning. This enables Emblem to cater to both professional designers as well as folks who want more of a hands off experience. We developed all new editing experiences aimed at simplifying the features we used the most in our professional design tools. In some instances, like the pattern generator, we had to completely invent new interactions to create the assets we were looking for. As good as our algorithms are we still understand the value and importance a little human creative power to really personalize a brand. One of the biggest pain points we really wanted to address while developing Emblem was the actual usage of a brand. We found the management of a new brand was often where our clients were having the hardest time. Always unsure where to access that one weird file format their t-shirt printer asked for, or unable to create a new Facebook banner image because they didn’t have the correct software. These are tasks we believe clients should be empowered to do on their own. These requests often lead to numerous back and forth emails as well as additional costs which can create frustration on both sides. The Emblem Brand Manager is where your brands live and where you go to download ready-to-use assets. Pre-cut, always on-brand, and always accessible. We are career designers who care deeply about the craft and spirit of our industry. So much so that we created a product to help alleviate some of the pain points we were experiencing on a daily basis in our own work. Hi, my name is Chris Edwards, I specialize in graphic design, interaction design, and motion graphics. I've been working in the design industry for over 10 years now at both tiny and gigantic companies. This experience has given me an astute ability to creatively solve problems of all scales and complexity. I'm also the Co-Founder of Emblem, a product developed to help bring premium branding to everyone.